The Women’s Art Association of Hamilton has been a part of the art scene in Hamilton for well over 100 years. Spearheaded by Mrs. Sara Calder, WAAH was created in 1894 by a group of very ambitious and affluent women. 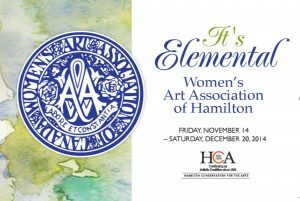 The Women’s Art Association of Hamilton is a collective of talented women artists and art enthusiasts with a goal to promote appreciation of the visual arts among its members and within the community. It's Elemental exhibition focuses on the elements that stimulate our senses and evoke intrigue. Whether it's the endless winter, hydrogen and helium or how the artist arranges line, colour and texture. Elements are at the foundation of who we are.